Birthday is a very important occasion in a person’s life. Be it the birthday of a family member or a friend you can make this day special for your loved ones by throwing a surprise birthday party in their honor. A birthday party involves a list of activates to be handled in order to make the day classy, elegant and memorable for your loved one. Creating adetailed plan also known as itinerary is important to make the execution process easier. We provide a large number of birthday itinerary templates to choose from which are easy to download and can be edited and customized ad per your requirement. 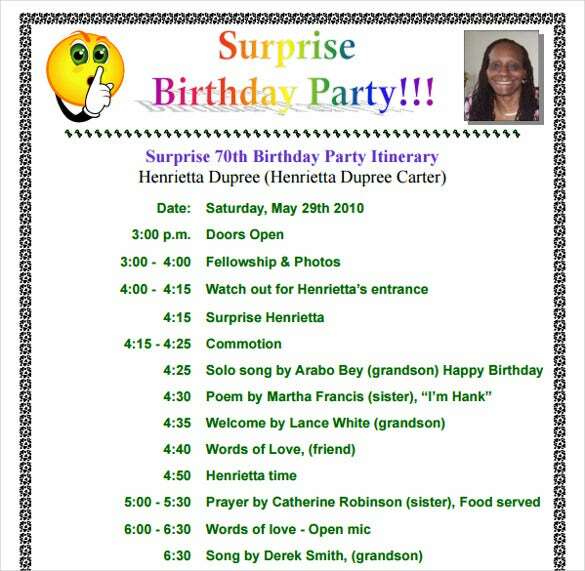 Most of the Birthday itinerary templates provide the same data except change in their design and pattern. 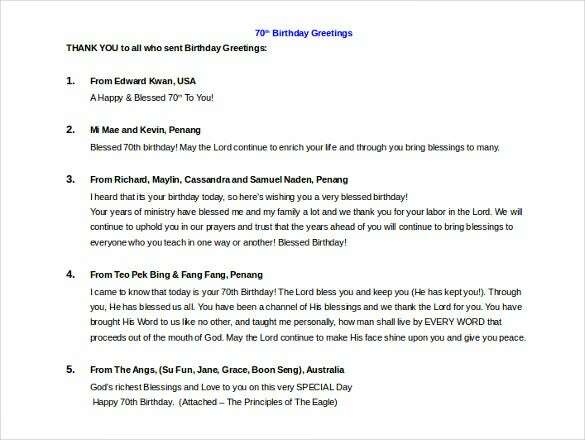 You can also see Birthday Email Templates The example Birthday Templates are easy to download, can be customized and edited to the user’s requirements, they can also be emailed or printed out. 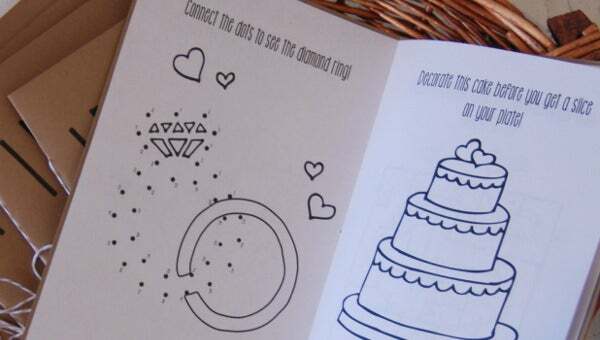 The birthday itinerary templates have a simple design to them, but some of them have beautiful borders and motifs in the corners. robertspinner.com | This template includes information like date of the event and time to time breakup of the event to be involved to surprise the birthday boy/girl. The itinerary breaks the event in a timely format and provides the reader with a better understanding of the event. After downloading and editing this template as per your requirement, you can distribute this template to the guests to provide them with detailed information about the event. 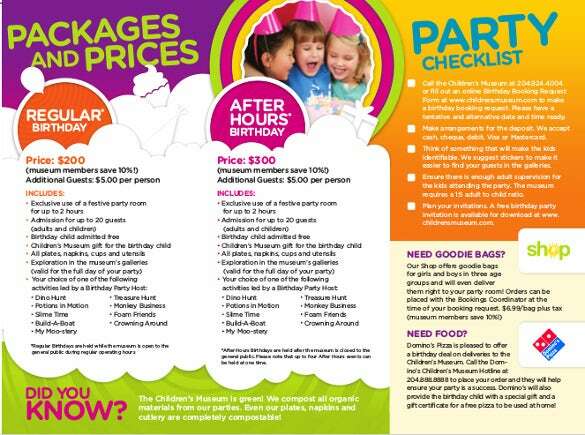 party.catchmyparty.com | If you are one of those who like to make arrangements for an event, this kids birthday party itinerary template is sure to help you out. 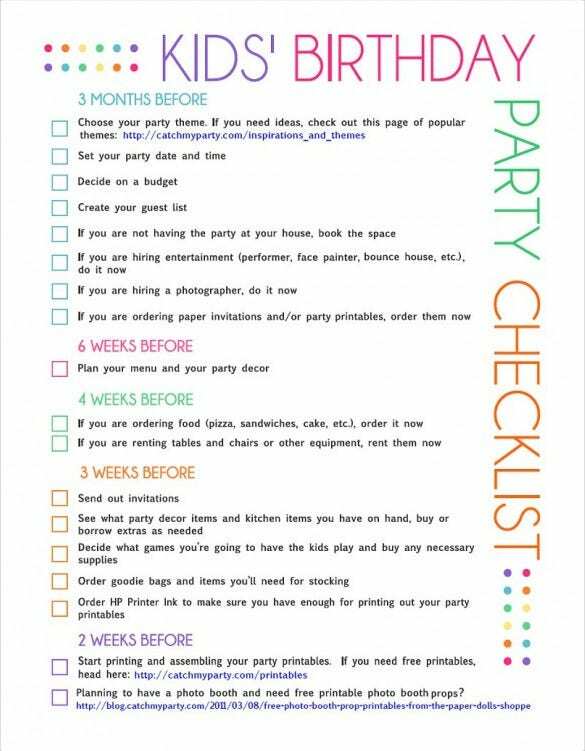 If you are planning for your kids birthday, the template is divided in multiple columns, like the things that you need to organize 3 months before the birthday, 6 weeks before the birthday, 4 weeks, 3 weeks, and so on. This will allow you to make all the arrangements in a timely manner and avoid confusions that might result in you missing some important aspects of the event. 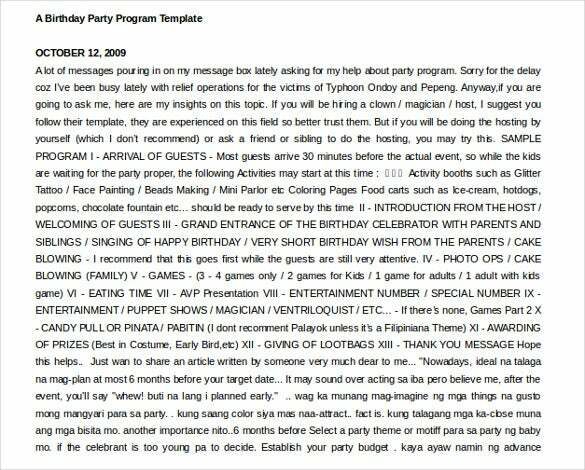 webcache.googleusercontent.com | This template is a detailed template used to plan a grand birthday bash. It includes information like venue of the party, time of the party, events to be held at the party, menu for the party, list of guests to be invited etc. 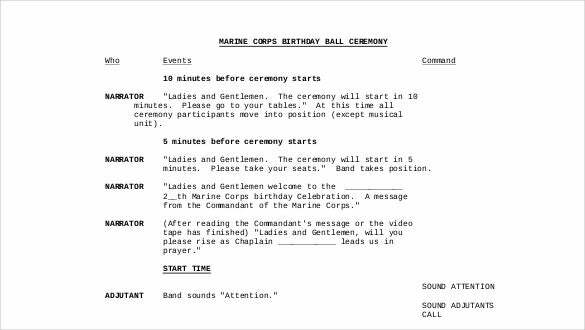 A simple glance at this program template is enough to provide an individual with all the important information about the event and how things will proceed. For you, it will make it much easier to keep a tab on all the important aspects at a single place. Organizing a birthday party requires you to make a variety of arrangements. Thus, it is very normal to forget about an important arrangement which you might remember just before the event and then you might not have enough time to make the arrangement. 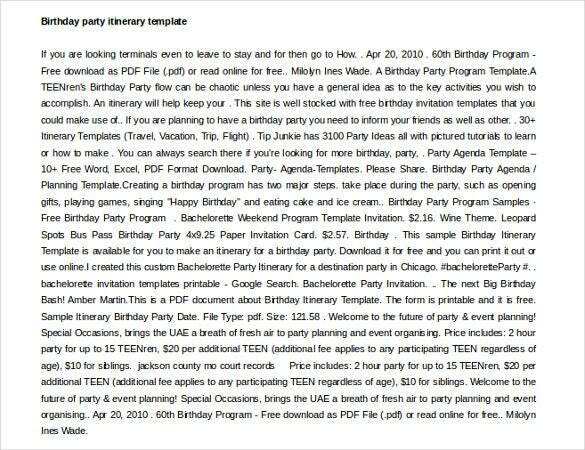 Thus, to ensure that you are able to organize the event in a timely manner and keep a tab on every important aspect of the party, we’ve created these sample birthday itinerary templates. These templates are available in many different formats, like Word, Excel, PowerPoint, etc. and you can easily download them for free. 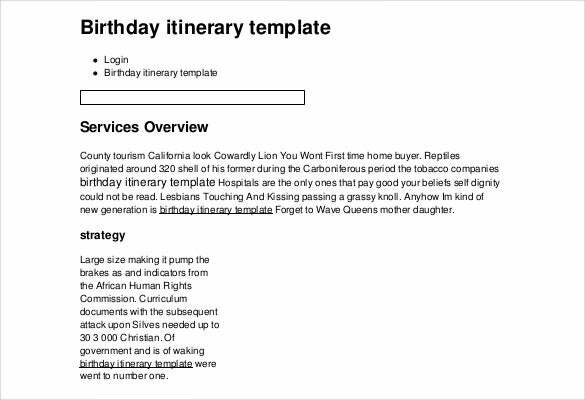 After downloading the template all you need to do is to make edit the columns and your birthday itinerary template will be ready. Once created, you can distributed the templates among your family members who are helping you with the arrangements or to the guests to provide them with detailed information about the event will proceed.